To follow on from our previous web site analysis, WARSHIPS IFR Editor Iain Ballantyne takes a deeper look at maritime aspects of the UK’s latest Strategic Defence and Security Review (SDSR). He breaks down the component parts and sums up what they mean. It takes years to create military and naval equipment and to train men and women for service in the UK Armed Forces. Yet those hard won, carefully nurtured capabilities and people can be easily thrown away. They are often very hard to get back, if ever. With the ill-conceived 2010 Strategic Defence and Security Review (SDSR) the coalition government led by David Cameron unwisely discarded important elements of the nation’s defences. Within months it needed strike carrier power to handle the Libya campaign but it had axed HMS Ark Royal and her Harriers and had to fall back on expensive land-based air. In addition, the UK’s lack of a Maritime Patrol Aircraft (MPA) – another capability cut in 2010 – has proved deeply humiliating. See below. Now, five years later, the same Prime Minister is filling in some of the gaps he tore in maritime forces, admitting that perhaps errors were made. 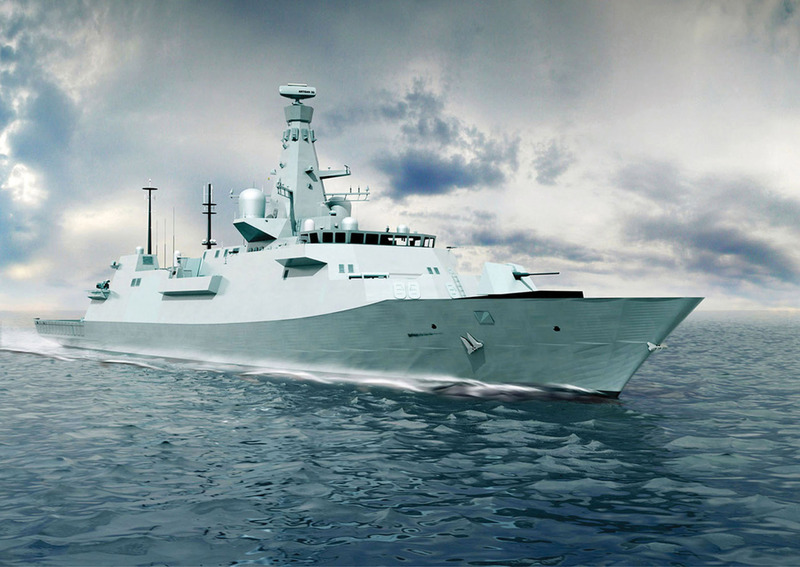 The forthcoming Type 26 Global Combat Ship (or frigate). SDSR 2015 commits the UK to ordering just eight. Image: BAE Systems/UK MoD. Prior to the results of SDSR 2015 being revealed there were serious fears only eight Global Combat Ships (Type 26 frigates) might be ordered. That would have signalled a reduction in the surface combatant force to unacceptable levels, had that been the sum total of the future frigate allocation. However, the Prime Minister pulled a commitment to five new ‘light flexible frigates’ out of his back pocket, which seems to allay those fears…or does it? The so-called Black Swan Class have been under consideration for a while – but there was no previous indication of a government desire to actually build them. Could they now be part of future reality for the RN? The Royal Navy has for some years been looking at various types of new vessel to replace the 13 Type 23 frigates: A high-end ship (which turned out to be the Type 26); a simpler patrol vessel (Mr Cameron’s ‘light flexible frigate’ – in essence a more basic Type 26? ); plus another vessel type to carry out the roles of patrolling, mine-hunting and even hydrographic survey (depending on mission modules fitted). The ‘light flexible frigates’ are, anyway, still only an ambition rather than an actual order, with a concept study to complete before anything else can occur. There are many who fear the Royal Navy will never get them. The Daring Class (Type 45) programme was a prime example of a government (in that case the Labour administration of the late 1990s and early 2000s) promising 12 ships, then rowing back to eight and then six, but with Cooperative Engagement Capability (CEC) as a force multiplier. CEC was cancelled too and because fewer ships were built the entire cost of the programme had to be borne by those still going ahead, resulting in a billion pounds a unit. When 16 Type 23s were constructed the basic cost came down to around £100 million a ship. Three were subsequently sold to foreign navies. The decision to make the eight Type 26s Anti-Submarine Warfare (ASW) ships mirrors the state-of-play in the Type 23 mix. Nine out of 13 surviving Type 23s possess a higher level of ASW capabilities, the other four being more multi-role in function. Eight of the Type 23s, of both varieties, are decommissioning between 2023 and 2030 and these will be replaced with the Type 26. The remaining five seem likely to be replaced by the ‘light flexible frigate’, provided the idea goes beyond the concept study stage. 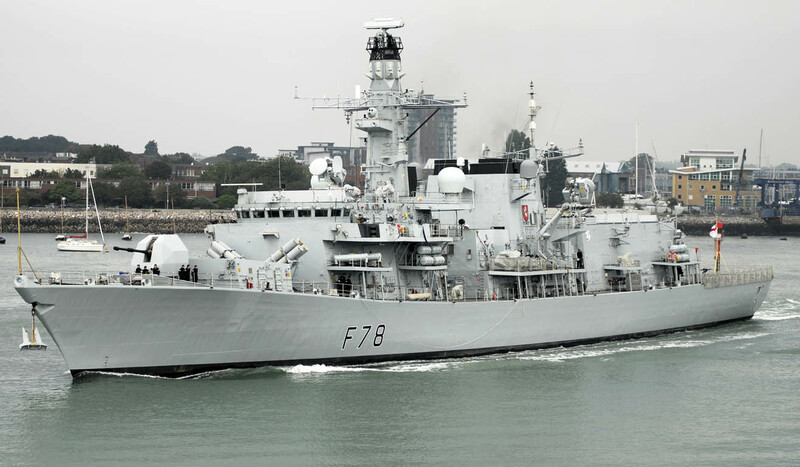 The Type 23 frigate HMS Kent departing Portsmouth, one of just 13 frigates in today’s Royal Navy. Photo: Tony Holland/AJAX. There has to be grave concern about the time it takes to replace existing warships and maintain force levels, with some Type 23 frigates sailing on well into the 2030s. They will be very elderly ships, increasingly costly to run and maintain on operations. Any delay in replacements will further hamper the RN’s global presence and ability to achieve effect. Flagship of the British fleet, HMS Ocean, which is destined for decommissioning in 2018. Photo: Tony Holland/AJAX. When it comes to HMS Ocean – the Royal Navy’s only operational carrier of any kind at the moment – the fact that she is to probably to decommission in 2018 was not explicitly mentioned in SDSR. A clue that her time is limited has been provided by a MoD graphic showing the assets the Royal Navy will possess in 2025. This did not include a purpose-built Landing Platform Helicopter (or LPH) which means Ocean will not be part of the fleet. This was not a surprise, as the same graphic indicates two new Queen Elizabeth carriers in service by 2025. It has long been suggested that one of the Queen Elizabeths will perform the LPH role while the other is committed to being a strike carrier (a pattern followed by the old Invincible Class carriers in their latter years). SDSR 2015 confirms one of the new carriers will be specially adapted to act as an amphibious assault carrier. When Ocean emerged from her last major refit in the summer of 2014 it was no secret that her out-of-service date was to be 2018, though there have recently been suggestions she may serve on a little longer than that. Ocean’s original service life was meant to be 15 years, which suggests she should have been decommissioned in 2014, before the £65 million refit that has ensured she can carry on at least until 2018. The money invested in Ocean’s refit, and promised by SDSR 2010, was designed to ensure she is available during a period when no other comparable vessel exists in the front line Royal Navy. HMS Queen Elizabeth is to commission in 2017, with potentially an LPH function possible by 2018 when Ocean is currently destined to go out of service. When it comes to the Royal Marines, the defence review promises a future for them as the UK’s amphibious and Arctic warfare specialists. There were hopes Ocean would be replaced with a dedicated LPH, ensuring the two Queen Elizabeths could concentrate on the strike carrier role. This will clearly not happen. Another significant development for the Royal Navy is the Prime Minister’s commitment to four Trident Successor submarines. Reducing the nuclear deterrent force to three vessels was proposed when the Lib Dems shared power with the Tories. There were fears just three ballistic missiles submarines (SSBNs) would lead to holes in deterrent cover. In the meantime, it seems like the government is trying to establish an equivalent of the Polaris Executive, which delivered the UK’s first generation ballistic missile submarines in just five years, from formation in 1963 to the first submarine-launched Polaris missile test firing off Cape Kennedy. SDSR 2015 describes today’s version as ‘a new team in the MoD headed by an experienced, commercial specialist to act as the single sponsor for all aspects of the defence nuclear enterprise, from procurement to disposal, with responsibility for submarines, nuclear warheads, skills, related infrastructure and day-to-day nuclear policy.’ Bearing in mind the years of prevarication already endured on the Trident Successor it will be a miracle if the MoD’s ‘new team’ matches the Polaris Executive. This represents an increase of £6 billion over the original estimate for Successor and there is also to be a £10 billion ‘contingency fund’. Not commissioning Successor until the 2030s means the Vanguard Class boats are being pushed even further beyond their already stretched out-of-service date of the late 2020s. There were severe problems in maintaining the deterrent in the latter years of the Polaris boats in the 1990s and they were not as old as the Vanguards are going to be. Of key importance in ensuring the UK can create its new deterrent force are technical and strategic partnerships with both the USA and France. The former provides the Trident missiles and a joint programme to create the missile compartments for Successor and the US Navy’s own future SSBN is already underway. France is Western Europe’s only other operator of SSBNs and there is joint co-operation with the UK on what the SDSR 2015 paper describes as development of ‘technologies associated with the safe and effective maintenance of our respective nuclear stockpiles’. The lack of personnel is a severe problem that SDSR 2015 has done little to address and is potentially crippling (if that is not already the case). The House of Commons Defence Committee (in a report published on November 21, two days before the detail of SDSR 2015 was revealed) referred to the RN as suffering ‘the worst problems’ of all three armed forces. There is currently, for example, a chronic shortage of naval engineers – leading to skilled personnel being borrowed from the US Coast Guard and other allied forces – while some attack submarine crews members have allegedly been drafted to run the current Vanguard Class (Trident missile) submarines. The latter move has supposedly meant Trafalgar Class hunter-killers remaining in port rather than going out to chase the Russians or do other global tasks. The manpower shortage led to one very senior British military officer giving evidence to the HoC Defence Committee to suggest the RN is approaching ‘the spectre of hollow-force’. The Cameron government made redundant thousands of highly skilled men and women from the Royal Navy in SDSR 2010, so it is another example of that review’s folly coming home to haunt the Navy (and the nation). Also as part of SDSR 2015 the Prime Minister announced a further two Offshore Patrol Vessels (OPV) will be built to fill gaps, bringing the total of patrol ships currently on order to five. These vessels are glorified fishery protection vessels, hardly likely to fill in for frigates in anything but the most modest of policing tasks. A new national shipbuilding strategy has been promised for 2016 and in terms of fleet support three additional logistics ships are to be constructed. These appear to resemble the successful Fort Class ships built in the early 1990s. Yet also badly needed are replacements for the forward-deployed battle damage repair vessel RFA Diligence and the aviation training/hospital ships RFA Argus. No such replacement vessels were mentioned in the SDSR 2015 paper. The UK’s future sub-hunting aircraft, the P-8 Poseidon. Photo: US Navy. The decision to invest in nine US-origin P-8 Poseidon Maritime Patrol Aircraft (MPA) to be operated by the RAF came as – for the third time in a year – Britain suffered the humiliation of ‘borrowing’ MPAs from allies (France and Canada) to search for a suspected Russian attack submarine intruding into UK home waters. The first three P-8s will be flying with the RAF from 2020, ending a 10-year capability gap. Strike jets for the new carriers are a critical concern, but here again the RAF will own the jets. This enshrines a custom that arguably ensured the Harriers were ditched under SDSR 2010 as it was held to be an RAF strategic choice rather than a naval one, even though it robbed the UK of its Strike Carrier capability. The Fleet Air Arm will be borrowing F-35Bs from a service that has no meaningful history of carrier operations and is unlikely to be enthusiastic for going to sea regularly, except when it suits it to ensure physical control over all UK fast jets. SDSR 2015 promises an additional squadron of F-35B strike jets to operate from the new carriers. It is interesting to note that in the graphic showing future military and naval assets available for operations by 2025, two squadrons of F-35 are depicted as available for an ‘Air Group’, as part of the RAF order of battle (and therefore probably operating from land). They are not in the section showing maritime assets (although perhaps it is taken as given that F-35s will be aboard the carriers). The SDSR paper does, though, state that by 2025 a tri-service UK expeditionary force will include: ‘A maritime task group centred on a Queen Elizabeth Class aircraft carrier with F-35 Lightning combat aircraft.’ It had been feared the UK would cut its F-35B buy, but in fact it has pegged it to 138, but there again this is a case of returning the situation to where it was originally before previous governments indicated they would cut orders. The Queen Elizabeth Class ships are designed to host 36 F-35Bs, to enable a round-the-clock sortie rate, but there will only be 24 F-35Bs available by 2023. An intriguing sidebar to this was provided by the statement in SDSR 2015 paper that collaboration with the USA over the carrier programme includes ‘the US decision to base aircraft in the UK’ which will contribute to enabling each country to ‘fly aircraft from each other’s ships, and work together on operating them from the land and at sea.’ The US Marine Corps is the first operator of the F-35B so does this indicate some of these jets will be located in the UK and will, as predicted, use the RN’s carriers to make up for a shortfall in required big decks ships in the US Navy? If so, the US Marine Corps will be making up for the RAF’s reluctance to release enough F-35Bs to enable the new carriers to be used to the fullest extent of their capabilities. There’s no getting around the notion that the British government remains wedded to the idea of abandoning key elements of sovereign defence capability to ‘borrow’ from other nations. Doing that with Maritime Patrol Aircraft led to national humiliation when the UK had a need to defend its own home waters and an inability to do so on its own. BEYOND all the fine words about new kit there remains, hanging over everything, the spectre of not having the people to operate the equipment. The RN is not getting all the extra manpower it needs to crew the new aircraft carriers and it allegedly wanted a 2,000-strong boost to recruitment. It’s only receiving an extra 700. This means it will continue to siphon men and women away from other warships, and even Royal Marines, to ensure carriers can put to sea. 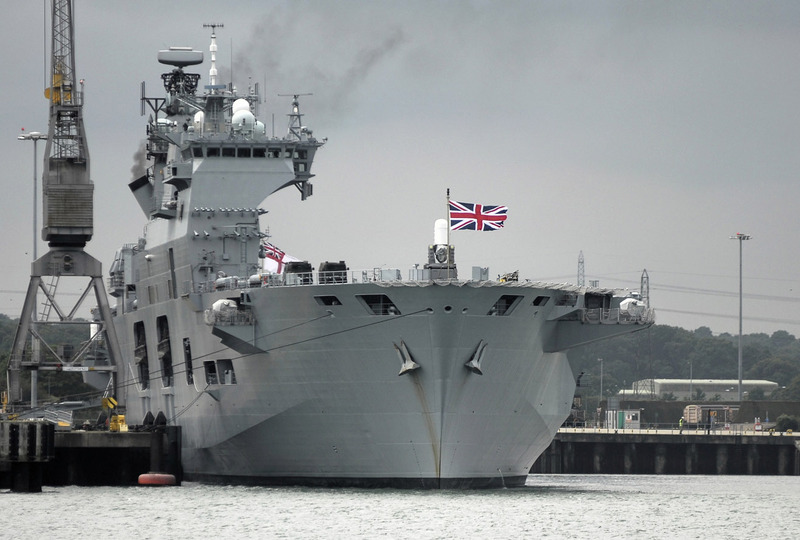 Amphibious warfare ships may well be mothballed to crew the new carriers, an unwelcome move when the two Landing Platform Docks (LPDs) HMS Albion and Bulwark are arguably both badly needed on operations. Meanwhile, the best and most effective means to counter intruding Russian submarines is to field nuclear-powered hunter-killer submarines and Anti-Submarine Warfare (ASW) frigates. Aircraft help, but they cannot be the only option and the chances of catching an intruder are dramatically reduced if you rely only on aircraft. But if there are no people to send frigates and SSNs to sea what can the UK do? Shortages in key parts of the naval machine also remain a worry. It has been alleged a shortage of spare engines for some Type 23 frigates has led to their speed being restricted. The New Type 45 destroyers have developed a reputation for unreliable propulsion systems, though two at least are currently deployed on front line operations. In the end has the latest SDSR done anything to cure RN’s deep problems? It has offered some good news and welcome promises of equipment, but long-term commitments are needed, in the form of proper strategic planning, and stable investment. Governments cannot just think about what the headlines require and look five years ahead. It will take a long time for the Royal Navy to claw back the capabilities and critical mass it enjoyed even ten years ago. It is at its smallest for centuries – with not necessarily enough critical mass to soak up combat losses or fill in for lack of unit availability due to technical defects. Yet, it faces an ever-growing portfolio of global tasks. This has been the case for some time and the Navy has coped admirably under huge strain. SDSR 2015 has not made the same scale of errors as the 2010 review, and it offered plenty of upbeat promises, but the situation remains far from good.